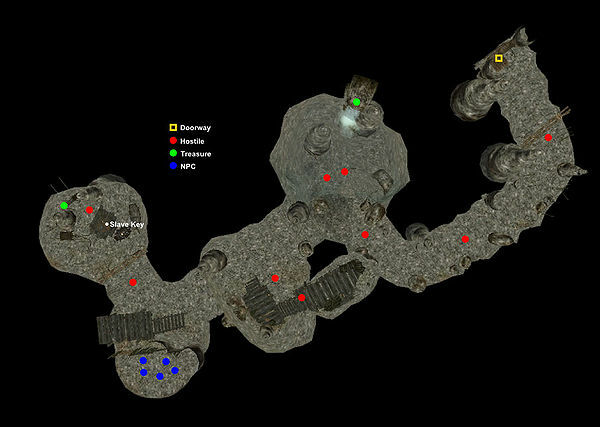 Kudanat is a small slaver hideout, west of Caldera, past the entrance to the Caldera Mine. 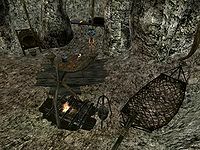 The loot in the cave is mostly random except for a handful of septims and a copy of the Unnamed Book, which increases your Short Blade skill. Random loot includes armor, weapons, scrolls, potions, skooma, moon sugar and other alchemical ingredients. 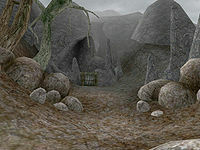 The cave is home to a host of bandits and their slaves, who can be freed in order to win the respect of the Twin Lamps. A small pool of water in the cave contains two slaughterfish. The Kudanat Slave Key cannot be found on any of the NPCs. Instead it is on the dining table in the last room at the end of the cave. Behind the waterfall over the pool of water there is a hidden chest with random loot. In some console versions this hidden 'Rusted Chest' is notoriously difficult to activate, requiring precise positioning while floating in the pool just to the left of the waterfall.